Over the years, piling lettuce, tomatoes and pickles on burgers has become the most popular way to dress them up. But there are a million other ways to build a better burger. Ready to transform boring into bold? Tame into terrific? Read on. All things equal: To make perfectly uniform patties like the pros, roll the meat in wax paper to form a log. Then cut into the desired thickness. Mix it: What’s the secret of a better burger? What’s inside, of course! Sprinkle in dill, basil, thyme or rosemary to add zest without adding calories. Or, mix in minced onion, garlic, lemon pepper, Italian seasoning, flavored breadcrumbs – even Cajun spices – to give your burgers real zing. Stuff it: You’ve heard of stuffed pizza. Well, how about stuffed burgers? Stuff the center of an uncooked patty with blue cheese, sautéed mushrooms, shredded veggies or zesty salsa. 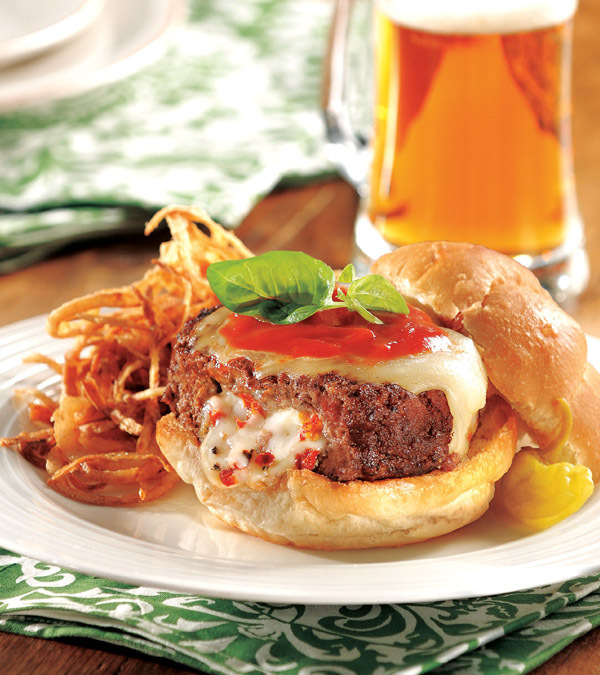 Top it: Just before your burgers are done, top with your favorite gourmet cheese. Then get creative! Finish off with sautéed red onions, steak sauce, horseradish, sun-dried tomatoes, pepperoni, pizza sauce, grilled jalapeño peppers or Canadian bacon. Be good to your burger: Don’t be tempted to smash your spatula down on your beautiful burgers. You’ll lose the natural juices. Instead, using a fork, poke holes in uncooked patties. Heat will work its way through and cook the meat evenly. Blue Cheese – Tangy, buttery and sharp, blue cheese melts beautifully. Mozzarella – Soft and delicately flavored, perfect for melting. Sharp Cheddar – Creamy with just the right balance of flavor and sharpness. Swiss Cheese – Nut-like flavor, smooth, delicious and easy to slice.